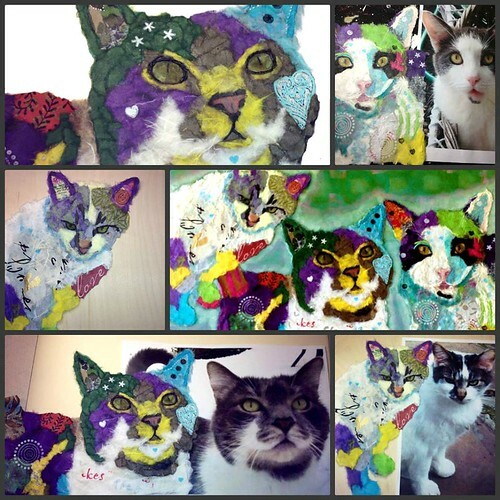 Mixed media and paper artist Robin Panzer has a special place in her heart for rescue animals. 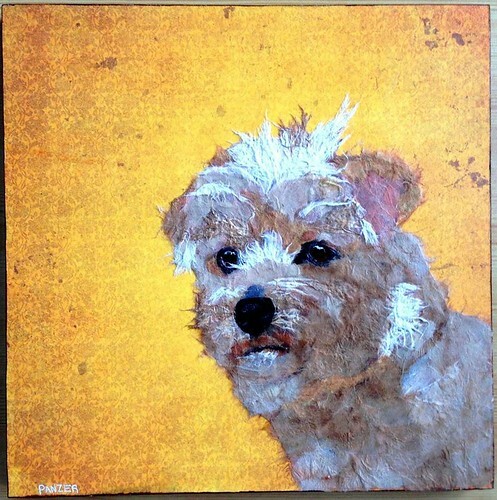 Her love of animals, especially dogs and cats, is evident in the lifelike pet portraits she creates with bits of hand torn paper and paint. The softly textured paper gives the impression of fur and Robin is able to make incredibly expressive eyes by building up layers of paper. 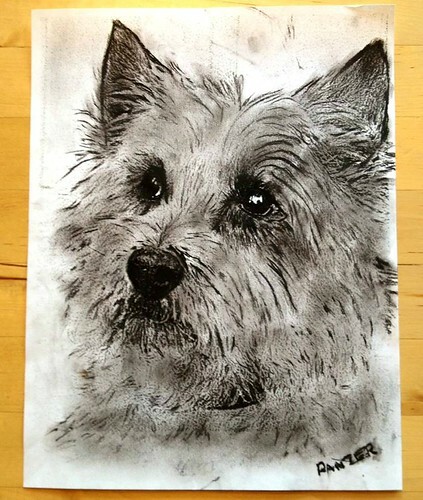 The first step of her process is to do a charcoal sketch while referring to a photograph. This helps determine nuances of the features, fur, and shadows. Curious to learn more, I asked Robin a few questions. 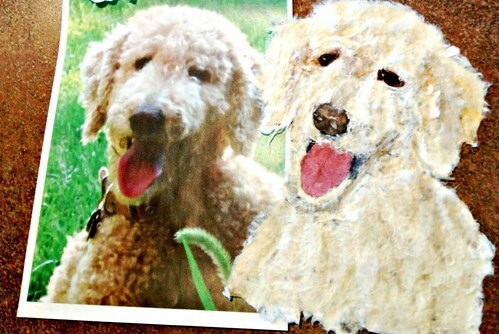 How did you happen to begin doing torn paper pet portraits? 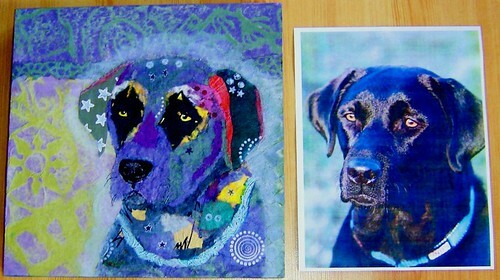 In 2010 I was asked to contribute a piece of art for an animal rescue auction benefit. I knew that many artists were already donating paintings and I wanted to do something different that would bring in money for the cause. 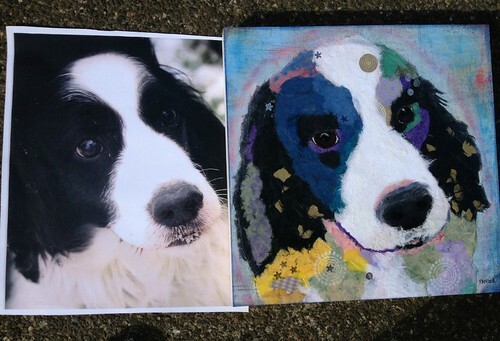 I had recently been gifted a box of handmade Thai and Japanese papers during an art retreat I hosted, thus my first hand torn paper pet portrait was born. It caused quite a stir and I've been a busy lady turning out portraits and memorial portraits of so many wonderful animals ever since. Are you formally trained in art or does it come naturally to you? I am not formally trained and the torn paper art came to me naturally. I am very kinetic by nature, a sensualist. Some people feast with their eyes or their sense of smell; for me it's always been touch. I can't help but run my hands over every item I see in a store. Working with paper and using my hands versus a tool just feels incredibly right. 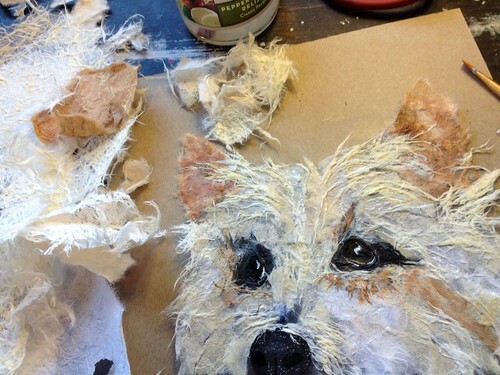 Funny anecdote, I actually thought I invented the way I create my hand torn paper pet portraits. I was disabused of that notion after meeting a lovely Japanese woman on the beach who came to see my art. She exclaimed, "Did you train in chigiri-e in Japan? Your work is incredible." chi--whaaa....so of course I ran to Wikipedia and found a beautiful art form and alas, sadly I am not the inventor. I love the personal connection of working with my clients to create a portrait that captures the personality of their special pet, and lucky me, more often than not my clients turn into dear friends after we embark on this creative journey together. Robin will be participating in and co-curating a gallery show of bird art in March of 2015 in Hood River, Oregon at the Columbia Center for the Arts. The theme will be Friends of a Feather Flock Together. She is a huge rescue animal advocate and owns three rescue dogs. Each month Robin sponsors a rescue group through her Facebook Studio Page by donating $1 for every new Like. 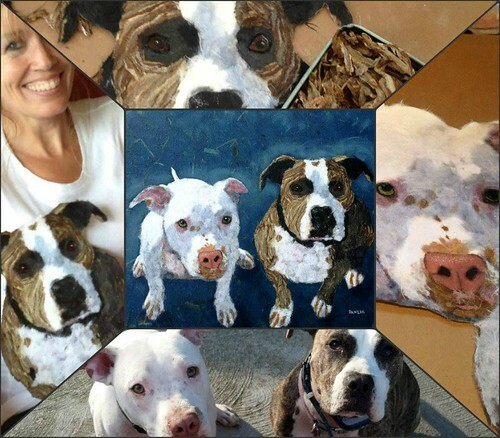 To commission a realistic or pop art style portrait, visit this page on her blog. Robin's Etsy shop is Robin Panzer Art. wow a true artist, love her work !!! Really wonderful and creative artworks! Thank you for sharing, Ann! Amazing what Robin can create with torn paper!! Incredible work !! 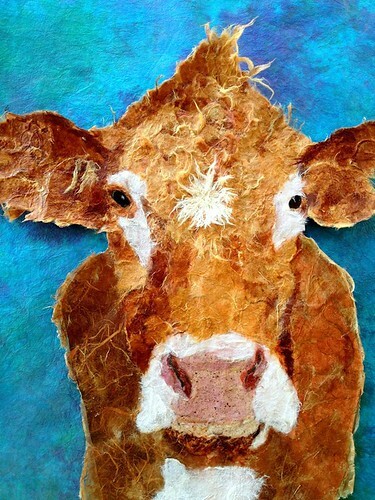 The torn paper cow portrait has so much depth and life .